The first two interviews with Kenny Dreer are done. In the can, as they say. Both days were long and tiring. We shot Kenny against the backdrop of his workshop. The hum of the heater was picked up by our audio equipment so we could only turn it on during breaks. As soon as we starting recording the temperature would drop fast. Kenny’s breath didn’t fog as he spoke (luckily!) but I think we were getting awfully close. Kenny was great throughout the ordeal. I’m really happy with how our shot looked but the shop layout forced us to have our key light more in front of him than normal. From his perspective I’m sure it felt very much like being in an interrogation room. He put up with it all and waited patiently while we dealt with camera issues or off-loaded video to our computer. By the end we were all pretty tired and some of the interview started to feel rushed at the end. We’ll have to come back to Kenny and revisit some of the things we talked about, but we’re going to hold off until we’ve interviewed other participants in the Norton Motorsports saga. Despite the challenges, we got great stuff, including the title quote for this post from Kenny’s description of the moment he knew that he had to move beyond the VR 880 and create a completely new motorcycle to carry on the Norton name. If you’ve met Kenny you know that he has a lot of energy and that he’s a very good storyteller. I think he’s going to translate well to the big screen. Our two days with Kenny, as well as our earlier interview with Joe Seifert of Norton Motors GmbH, started to answer a lot of questions I had about the Dreer Norton story. I still have a lot more, though. What about you? What questions do you want to see answered in the film? Let us know in the comments and we’ll see if we can cover them. Did you change formats? I saw the HDV camera on your home page. HDV = tape so no need to off-load or are you coming off HD-SDI to the computer? Rennie, you’re right. Our main camera is the XH A1. But we also used a Canon 7D for close-ups and alternate angles during the interviews. I’ve heard that one of the Berliner brothers (Norton importers before the Commando days) is still alive. No one has ever done a real documentary or book about Norton in America. If he’s still compos mentis and he talks to you you could use the material as background for your story or, alternatively, use it for a different project. I don’t know how to get hold of him but I’ll bet that Brian Slark at the Barber Museum could put you on the trail. Thanks for the tip, Marc. We’ll do some investigation and report back. The Berliner Bros were not just Norton importers BEFORE the Commando era, but right into it. Norton took the West Coast away from them, setting their own operation up under Bil Colquhoun and Mike Jackson (both still alive, see http://www.andover-norton.co.uk/Bob%20Reynolds.htm). I have microfilms of the Norton production/despatch records here, and Norton had a stamp “Berliner” for those books because they took so many bikes- all other dealers were entered by hand. Must be fascinating to interview them, but then that has nothing to do with your subject, Kenny Dreer. When Kenny entered the scene as “Vintage Rebuilds”, the Berliners were already history for at least 20 years. 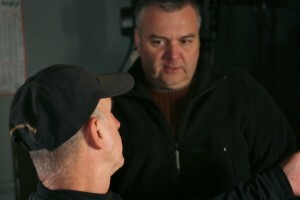 Thanks Joe, one of the biggest challenges is trying to confine the scope to the story at hand. 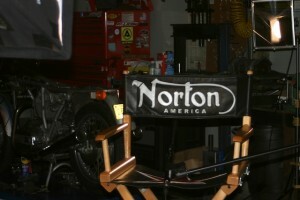 While it would be fun to try to document the history of Nortons in America, the reality is that this movie will be about Kenny Dreer’s Norton America. That’s not to say there may be some background information presented about Norton but it won’t be the focus. When Norton-Villiers took over the seven Western states in January 1969 from the Berliner Corp. sales started to climb. From a 1968 sales figures of 25 in the hot bed of motorcycling, Southern California, to 1,000 +in the first year we grew in sales and popularity. A big presence for a company with a very small market share, think Ducati today. One day we will get it documented. Brian, we do want to have a bit of background on Norton but we can’t include every detail. You are definitely on the short list of people, that budget willing, we would like to interview. Don’t forget to put in his 3 day vist to the uk after aquiring the norton name with joe siefert in germany. Although his older brother Joe is sadly gone, Mike Berliner is very definitely alive and compos mentis. I went to school in the 70s with his daughter, in Paterson, NJ, A real gentleman of the old school, when business was done with a handshake and a man’s word was his bond, I wish we had more people like him and his brother around today. They started with less than nothing after WW2 and were instrumental in the creation of the modern motorcycle industry. As well they were responsible for the production and sale of one heck of a lot of the classic British bikes we have around now, along with a lot of Ducatis and Moto Guzzis. Good luck with the Dreer story, maybe the Berliner story next?